Gotham is littered with talented performers. And don’t think you have to fork over a cover charge and two-drink minimum to see these people showing off their talents. In some cases, all you need is a MetroCard because the subway and subway platforms are filled with people singing and dancing, in the hopes you’ll give them some change, a practice more commonly known as busking. Check out some of these eye-opening and ear-pleasing performances and be prepared to never look at busking the same way again. The Drumadics have earned a following for their cool, sassy sound. When you hear them in action, it’s not hard to understand why people like this energetic and group. The sax player from Drumadics is also part of a jazz funk trio called Too Many Zooz. They’re downright amazing and bound to make any commute more tolerable. This guy is known as Geechee Dan and simply doesn’t look like he should be able to belt out a song with the soulful ‘60s authority he does. His pipes pack quite a punch. Okay, we’re going to leave New York City for a moment and go overseas to Europe where “busking ninja” Infidelix joined forces with a woman named Silvia Rodriguez for this unforgettable rap performance. This singer-drummer has got all the goods. His voice is unique and his abilities with the drums are more than solid. Look at how the people are totally caught up in his performance. That’s the mark of someone who knows what he’s doing. These guys are part of a band called Blac Rabbit that wins raves for this perfect and understated Beatles cover. This artist is named Damiyr, although we think it should be Daaaamiyr because daaaamn this is fantastic. This pensive cover of “Use Somebody” is the type of thing that gives chills. This band is great for many reasons, not the least of which is the boy in the back who’s banging a water bottle. They’re like a combo of a reunited ‘70s group and every wedding band that’s ever played. Coyote and Crow is a husband-and-wife team who’ve got the market on banjo (they have a stand-up banjo bass, for goodness sake) cornered. 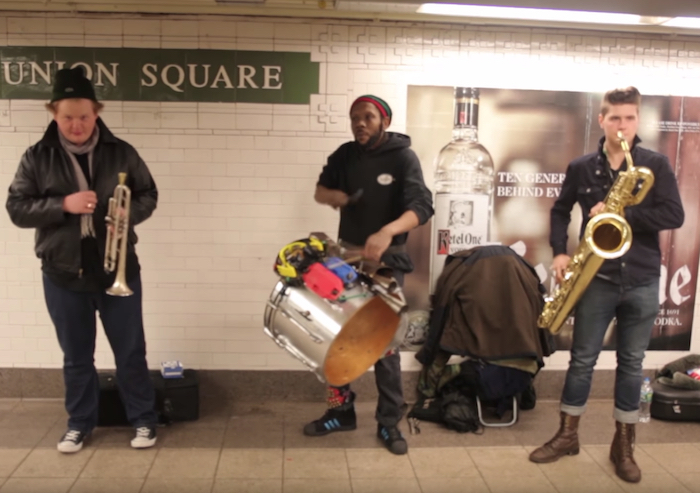 They play a down-home style of music that seem at odds with the hustle and bustle of New York City, but still manages to work. Vilray is the singer in this clip. He has a captivating Sinatra-style voice and is one-half of what may be the deftest whistling you’ll come across. CHECK OUT OUR ARCHIVES FOR MORE ODD NEWS STORIES AND FOLLOW ODDEE ON FACEBOOK and TWITTER.